You may have been taught that it was Adam, the first man of Genesis, who attempted to name all the creatures of the earth. However, it seems that the most prolific giver of names was a plucky Swede named, Carl. 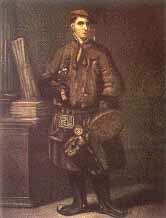 Today is the birthday of Carl Linnaeus, also known as Carl von Linné or Carolus Linnaeus, is often called the Father of Taxonomy. His system for naming, ranking, and classifying organisms is still in wide use today (with many changes). His ideas on classification have influenced generations of biologists during and after his own lifetime, even those opposed to the philosophical and theological roots of his work. Like the original namer, Adam, he set to work dividing the starfish from the swordfish. He was a botanist. He taught at universities. At a time when Sweden was one of the poorest countries in Europe, Linnaeus set out to import exotic plants and animals, hoping they could be raised for profit in Sweden. He hoped to raise tea and coffee, ginger, coconuts, silkworms. He experimented in clams. It was at a time when people named plants and animals in many different ways, usually based on what they looked like: Queen Anne's lace, ghost orchid, and swordfish. But even within a single country, a plant could be called by half a dozen different names by different people, so Linnaeus decided to develop a naming system based in Latin. 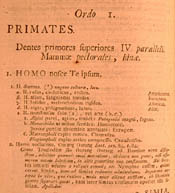 He put each specimen into a large group called a genus and a smaller subgroup called a species, and that became the binomial naming system, which he published in 1758. His botanical experiments failed. The tea plants died. The coffee didn't make it in Sweden, and neither did ginger or coconuts or cotton. Rhubarb did though, and Linnaeus, late in his life, said the introduction of rhubarb to Sweden was his proudest achievement. But today we remember him for his contribution to taxonomy. When he published his taxonomy in 1758 he listed 4,400 species known to science at the time. Today there are more than one and a half million. Today taxonomies have a new energy propelling the naming of things. First, the technical field and other communities of practice struggle to organize the burgeoning bloom of data. Second, the world's scientists race to document all species as global warming, human destruction of habitat and pollution threaten the planet's biodiversity. The ALL Species Foundation is a non-profit organization dedicated to the complete inventory of all species of life on Earth within the next 25 years - a human generation. To describe and classify all of the surviving species of the world deserves to be one of the great scientific goals of the new century. In applied science, this completion of the Linnaean enterprise is needed for effective conservation practices, and for impact studies of environmental change. In basic science, it is a key element in the maturing of ecology, including the grasp of ecosystem functioning and of evolutionary biology. It also offers an unsurpassable adventure: the exploration of a little-known planet. Take a stroll through the Taxonomy Warehouse.